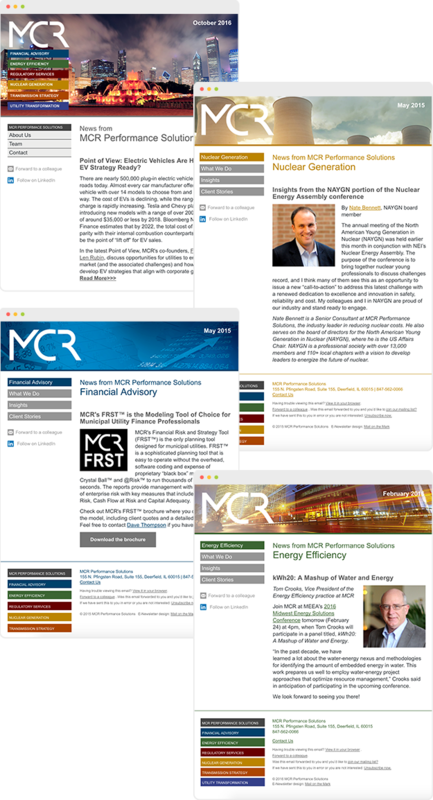 Visible Logic created a set of e-newsletter templates for MCR Performance Solutions, one for each of their practice areas, that matched the web site we designed with color and imagery. Many of the articles and white papers on MCR’s web site require registration to view. These web site users are pulled into Mail on the Mark, based on area of interest, and added to the appropriate email list. MCR’s consulting services are divided by practice area. Their lists are segmented by interest area and recipients receive content only pertinent to them. We designed a distinct template for each practice area. Each newsletter template is different yet coordinated with their brand image.